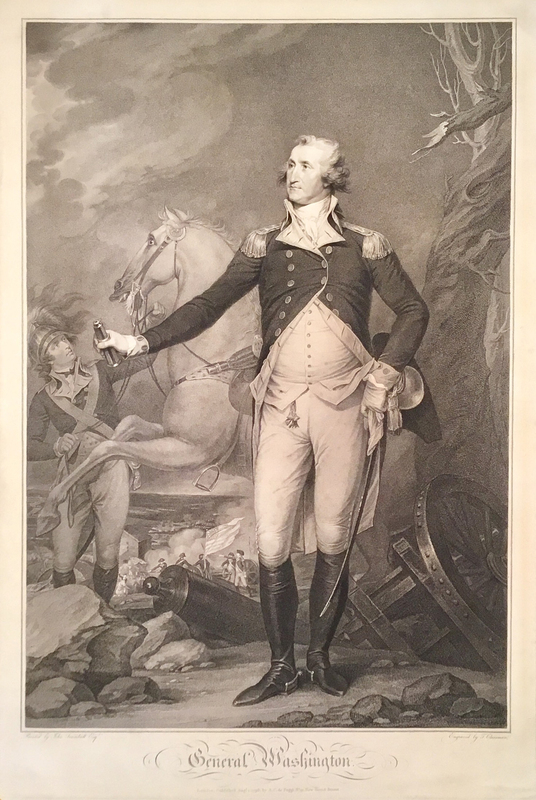 Painted by John Trumbull Esqr.--Engraved by T. Cheesman. / General Washington. / London, Published Augt. 1. 1796, by A. C. de Poggi No. 91, New Bond Street. Version I: As shown, without border and lettering except "10th. 1795 by A. C. Poggi New Bond St. London." Version II: As shown, before border and with address, preceding title: "London, Published by A. C. De Poggi No. 91, New Bond Street, June 1796." Version III: As shown. Collection: National Portrait Gallery. Version IV: As shown, without date and with inscription in a different letterface. When John Jay traveled to London in 1794 to negotiate the peace treaty with Great Britain, John Trumbull accompanied him. Trumbull took with him a copy of his painting General Washington at Trenton. The publisher Antonio di Pioggi arranged for this exceptionnally large engraving by Thomas Cheesman. Hart says that this engraving is substantially similar to Boglewood 1802, but "clearly a different plate." He notes particularly that this image shows less of the arm and plume of the soldier along the left margin.